Time and climate are not our friends when it comes to paintings or our skin. Craquelure is the network of fine cracks that appear in the skin of a painting. Many things can cause these cracks. Sadly, much like the human face, cracks occurring in the paint layers or ground are usually indicative of age or stress. Instead of the scull, these cracks run through the layers of a painting. They take the form of a dense network of fine fissures which run in straight or slightly curved lines. Think laugh lines. Sometimes they happen because of the oxidation process, others can occur within the dried and fully polymerized (non elastic) layers of paint. 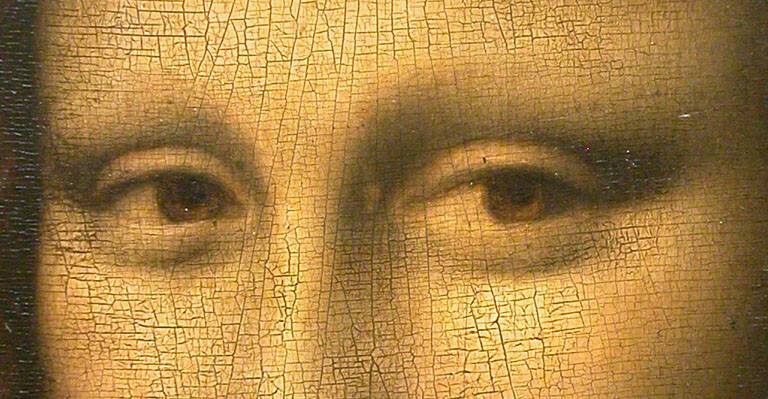 In modern paintings, it’s usually the consequence of using poor materials. Crazing is when the cracks appear in varnish but have not yet penetrated through the layers of paint. This usually happens when improperly prepared varnish mixtures have lost their bond. These types of cracks can usually be removed by removing the varnish. Drying cracks are not the same as aging cracks. Drying cracks include flame cracks that are small and short, often from paint dotted with a brush after painting. Brushstroke cracks occur in areas covered with really thin paint. Lean chalk grounds cause spiral cracks and paints on thin canvas. Grid cracks are found only in 19th and 20th century paintings and are caused by painting on smoother grounds. Net cracks, named after their appearance, happen when the paint has been manipulated and applied in many directions on a structured canvas. Drying cracks in varnish are pale and extend down through the paint as far as the ground, but not into the ground. They are always the result of painting technique. Craquelure can also be caused by mechanical stresses. Forgers, after using ovens to dry and harden oil paint can roll a painting over a cylinder. Picture distortions create cracks when something has pressed the canvas from the back or even a forger using their fingers. Aging of the picture layer, micro pores and micro-fissures (aka blanching), and stresses caused by tension and pressure can also cause cracking. Cracks on wood panel paintings create garland cracks, diagonal cracks, spiral and corn ear cracks caused by pressure. To make things even more complicated there are also artificial craquelure done for effect. I used a product called Vernis a Craqueler by a French company for an exhibit I did with the late Gage Taylor called “Alien X-mas” at Anon Salon in San Francisco. It is a two step process using oil and water based varnishes to get the effect. 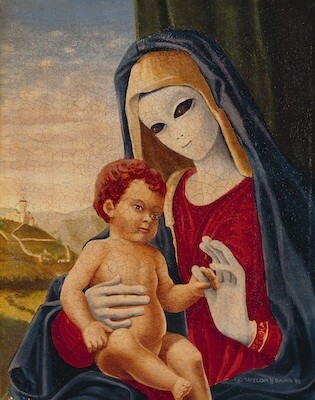 The painting was called “Peace on Earth”. Previous PostArt Critics: ​Keeping Art In Its Proper FrameworkNext PostHow Do You Start Your Own Art Collection?